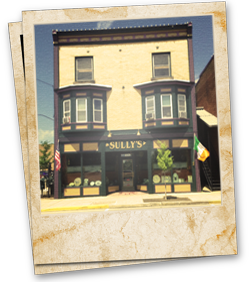 For the ultimate Irish pub experience, Sully’s Irish Pub makes you believe you have a little piece of Ireland right here in Medina. From Irish beers and liquors to traditional Irish food and of course, Irish music & live events makes Sully’s your favorite place to stop. We make you feel welcome every visit, which is the definition of Irish hospitality. If you're interested in an order of our famous Fish & Chips, a fresh pint of Guinness or a friendly face to converse with, our staff is always ready and willing to help. Stop in for a pint after a hard days work or for a Corned Beef Reuben during a baseball game. Bring in your friends to celebrate a birthday, a retirement, a wedding - or just to celebrate life. Soccer @ Sully's has no kitchen service until regular hours. Bar open 15 mins before first kick.